Recouping overpayments from employees can be a good experience, but often isn’t, said Barbara Youngman, CPP, senior payroll analyst at Toyota Motor, North America. Youngman and LaTisha O’Neal, CPP, payroll supervisor, co-presented a workshop on payroll overpayments to attendees at the American Payroll Association’s 36 Annual Congress in May. Recoupment framework. You can treat a wage overpayment as an advance or a loan, but the best approach to recouping that overpayment, according to Youngman, is to treat it as a deduction. This has consequences, depending on whether the overpaid employee is nonexempt or exempt under the Fair Labor Standards Act. Nonexempts need not give permission for deductions, but deductions can’t be made from overtime pay and can’t leave them with less than the minimum wage. Exempts must receive their guaranteed salary every week, so no deductions can be made. You can deduct from nonguaranteed pay, such as bonuses or vacation time. The FLSA aside, under states’ wage payment laws, deductions must be voluntary—made without fraud, undue influence, duress or coercion—and authorized by employees in advance, Youngman said. Authorizations can be generic and included in employee handbooks. The better option: A specific authorization detailing the pay periods during which the deductions will be made, whether deductions will be a percentage of gross or net pay and provides employees with a period to revoke their authorization. Partner with HR, which will contact the employee, negotiate the repayment schedule with the employee and ensure that the authorization form is signed. Getting the taxes right. Taxes have been withheld from the now repaid overpayment and they must be accounted for, said O’Neal. If the overpayment is recouped in the current quarter, employees repay the net, either by check or payroll deduction. You adjust the wages and void the payment. Everything will reconcile at the end of the quarter, O’Neal assured the audience. If the overpayment is recouped in a later quarter of the same year, you adjust the quarter during which the overpayment occurred and employees’ W-2s will be correct. However, you must ensure that your payroll system can handle this, she added. You’ll need to file Form 941-X. If the overpayment is recouped in a later year, employees repay the gross, current year wages aren’t impacted and you must get their separate authorization to refund the overwithheld FICA taxes to them. You must also file Form 941-X and provide employees with Form W-2c (adjust the FICA wages only), she said. 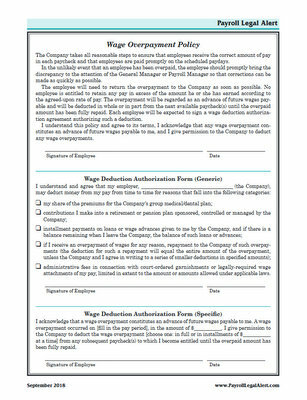 SAMPLE POLICY & FORM: We’ve included a sample company policy and two employee authorization forms below. You can customize them to suit your needs, but you should run them by the company’s legal counsel before using them.